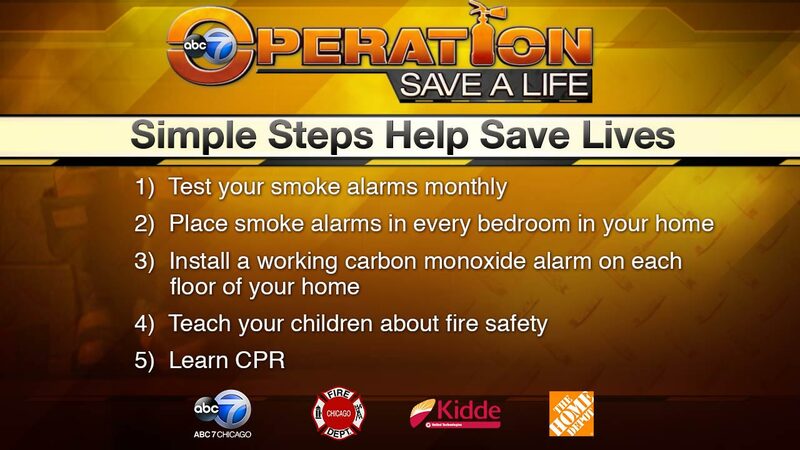 CHICAGO (WLS) -- ABC 7 Chicago, the Chicago Fire Department, Kidde (a global leader in fire and safety products), and the Home Depot are proud to once again present "Operation Save-A-Life," a public awareness campaign targeting fire/carbon monoxide safety and prevention. Fire and carbon monoxide fatalities are often preventable through education and the use of smoke/carbon monoxide alarms and basic prevention tips. The message that "Simple Steps Can Help Save Lives" will be once again the focal point when ABC 7's Operation-Save-A-Life campaign kicks off its 12th year on February 9th. The campaign will underscore the importance of remembering test your smoke alarms monthly and to make sure you've installed a working carbon monoxide alarm on each floor of your home. Missing or non-functional batteries are to blame for a great majority of home fire fatalities. According to the Chicago Fire Department, since ABC 7 Chicago began this fire safety and prevention campaign, fire fatalities have decreased by 50 percent. "It's always our hope that our Operation Save-A-Life campaign will help contribute to the reduction of the total number of fire deaths in our city. We are grateful for the team effort put forth by our partners -- the Chicago Fire Department, Kidde and the Hope Depot," said John Idler, President and General Manager, ABC 7 Chicago. -- *In 2013 there were a total of 16 fire fatalities, the lowest annual total ever recorded in the city. -- ** Smoke detectors are in 92% of American homes, but nearly one-third don't work because of missing or old batteries. --*Almost all fire deaths in Chicago occur in buildings where there are no working smoke detectors. Detectors with run-down or missing batteries are worthless. * Provided by the Chicago Fire Department. **Provided by the National Fire Protection Association. Save-a-Life Saturday, a free event teaching fire safety, carbon monoxide safety and guidance in choosing the right home alarm, will take place at participating Home Depot locations throughout the Chicago area on March 7 from 9am to 3pm.